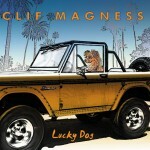 Share the post "Album review: CLIF MAGNESS- Lucky Dog"
Clif (short for Clifton) Magness may not be a household name, but is one of those respected songwriters essential to the music business. His collaborations have covered artists as diverse as Steve Perry and Avril Lavigne, co-writing much of the Canadian punk popstrel’s multi million selling debut ‘let Go’. Taking a break from his writing and production schedule he has released only his second solo album and first in nearly a quarter of a century. With the exception of son Evan providing a few guitar solos, it is a solo effort in every sense of the word, but the opener ‘Ain’t No Way’ is a revelation, with a Van Halen vibe and raspy, gang-style vocals that you might not expect from the figure with receding hair and a neat grey goatee staring out from the album cover. ‘Don’t Look Now’ is another uptempo melodic rocker with lively guitar work, but the album’s crowning glory is ‘Unbroken’, a gloriously melodic, mid-pocket mix of Chicago, Def Leppard, Glen Burtnick and ELO which may well end up being my song of the year. In a similar vein, ‘Maybe’ is not far behind with the vocal arrangement again reminding me of 80’s Chicago, and having been co-written with fellow songwriter to the stars Kara DioGuardi, may end up in the hands of a famous pop act. ‘Love Needs a Heart’ has a rare guest appearance, from Robin Beck who sings the second line of the chorus in a way which again shows off Clif’s way with a melody, though it is sandwiched by two rather average songs in ‘Like You’ and ‘Nobody But You’. ‘Shout’ is an agreeably raucous rocker with a guest solo from noted guitarist Tommy Denander, though this is a very diverse album rather than purely a heavy rock one, and so it is that two mellower, atmospheric songs in ‘Rain’ and ‘My Heart’ close the album, either side of ‘All Over My Mind’ which also has some Leppard-esque vocal arrangements. While a little patchy, the highs on this album are very high indeed and proof that good songwriting is an art only the finest can master. This entry was posted in ALBUM REVIEWS, ALBUM REVIEWS (Mobile), All Posts and tagged album, AOR, Clif Magness, melodic rock, Robin Beck. Bookmark the permalink.